Learning Chinese, what we use on iPad & iPhone Pleco « Adafruit Industries – Makers, hackers, artists, designers and engineers! Pleco is the ultimate Chinese learning companion – an integrated Chinese dictionary / document reader / flashcard system with fullscreen handwriting input and live camera-based character recognition. Dictionaries: the built-in one has over 20,000 example sentences with Pinyin, the popular CC-CEDICT is available as a free add-on, and 7 other wonderful dictionaries are available as paid upgrades. 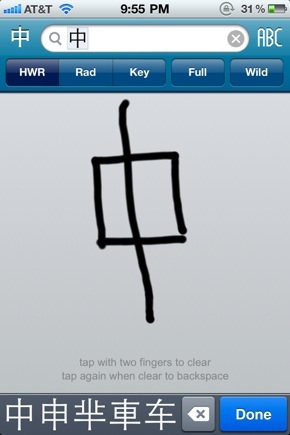 Fullscreen handwriting: use the entire width of your iPhone’s screen to draw characters. Live Optical Character Recognizer: look up words simply by pointing your device’s camera at them, or by tapping on them in a still image. Flashcard System: create a card from any dictionary entry with a single button tap, import premade word lists, use advanced memorization techniques like SRS (spaced repetition), and study in a variety of modes including fill-in-the-blanks handwriting and tone drills. Powerful search: look up words by Chinese characters, Pinyin (spaces and tones optional), or a combination, with support for wildcards and full-text search. 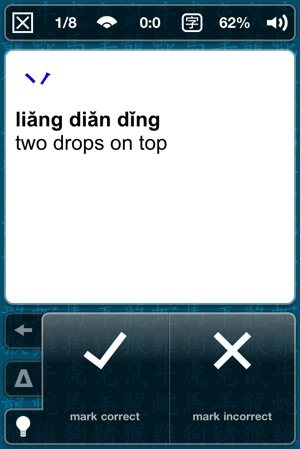 Cross-referencing: tap on any Chinese character / word in any dictionary entry to bring up its definition. 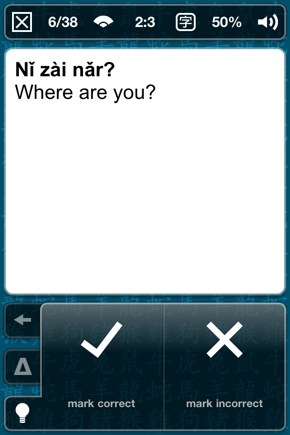 Audio Pronunciation: instantly hear a native-speaker audio recording of each Chinese headword; recordings are available for over 34,000 words. Stroke Order Diagrams: animations showing you how to draw each character; over 20,000 characters are covered. Software is sold only through in-app purchases, those purchases can be transferred to other devices that sync to your iTunes account just as with any other iOS software; simply load up the free version on each device, open up the “Add-ons” screen, and tap on the “Restore Purchases” button to activate your purchase on each device. We got the $100 pack and so far we’re really enjoying it, the flash cards are really good and can be shared across devices.